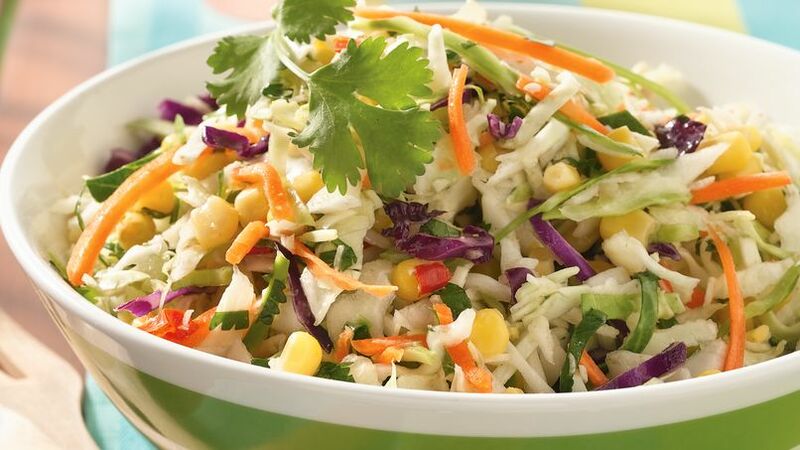 In very large (4-quart) bowl, toss coleslaw mix, cilantro and corn. In container with tight-fitting cover, place oil, lime juice, salt and cumin; shake well. Pour over coleslaw mixture; toss. Cover; refrigerate 1 to 2 hours to blend flavors before serving. Mysteriously, coleslaw always seems to shrink in the refrigerator! This version also shrinks a bit in the fridge, and as is typical with vinaigrette-based slaws, some of the cabbage pieces become translucent during storage. Two cups frozen corn, cooked as directed on the bag and rinsed with cold water, can be used instead of the canned corn. If your family likes things hot and spicy, add 1 jalapeño chile, seeded and finely chopped, to the coleslaw mixture.